Opportunistic investors made a killing off of Twitter rumors today. What happens when a rumor about a company surfaces during a turbulent market? With the market see-sawing every day since the beginning of this year, and a barrel of crude oil becoming cheaper than a full tank of gas, people are clutching on to any positive markets news they can get. 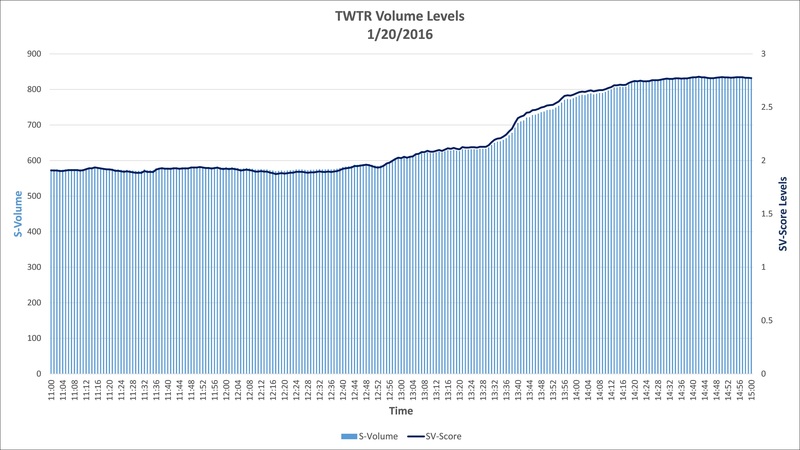 Now, the rumor: Is Twitter (TWTR - Get Report) in play? Shares of the company finished the day's trading up about 4% on rumors that News Corp (NWS - Get Report) , owner of The Wall Street Journal and book publisher HarperCollins, might be taking a stake. Soon enough, people started responding to the tweets about the rumor and buying Twitter stock. They were following the simple rule of market: buy the rumor, sell the news. It was a win-win situation for investors -- buy at low price (Twitter is trading lower than its IPO price), and sell when the market reacts to the rumor. If it's not a rumor, the market would react in a positive direction anyway. Those following social media, had an even better edge. The quantitative metrics published by Social Market Analytics (SMA) showed that the normalized sentiment and volume were trending in positive direction well before the price took off. SMA, the company I work for, takes in and processes all tweets and then filters out the ones that are tweeted by approved accounts. A sentiment rating is then given to a ticker symbol based on these tweets. These ratings are normalized over using a 20-day moving average to get an S-Score. The S-Score explains how many standard deviations away the sentiment of the stock is as compared to the normal sentiment. Twitter was trading at a record low this morning. A discussion on Twitter at 12:05 PM about Rupert Murdoch being interested in Twitter was captured by SMA. The sentiment on the stock started changing in the positive direction as a result of the rumor discussion. Less than an hour later, the sentiment had done a complete swing and crossed over to become positive at 12:59 PM. SMA's alerting system would have given out alerts of the sentiment movements between 12:53 and 1:17 PM. The sentiment had changes as much 1.73 standard deviations away from its S-Score levels. Of course, gains receded as the rumor was eventually classified properly -- as rumor. But investors who incorporated social alpha into their models already made huge gains by then.